This year the winter modifications are more about comfort and confidence, however what started as a simple list of "upgrades" and changes turned out to be a considerable amount of work leaving very little unchanged in terms of the interior space transmission and exhaust system. So we spent some time during the Autosport show in January 2016 discussing and selecting all the options for the seats. Over an hour and a half making sure every detail is correct , this is the level of attention to detail you will get from Motordrive. 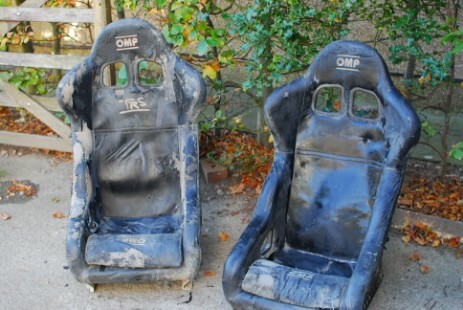 This is what the old seats looked like once removed from the car, they have done good service as these where origonaly fitted in Insanity-1, however, they arre now showing some sighns of use. The new Motordrive seats fresh out of the packaging. The embroidered logos look good in the team colours. 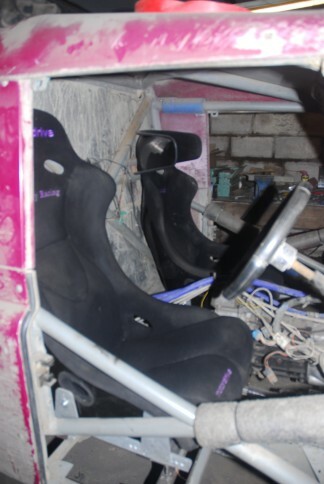 And the seats located on there new mountings before any of the new floor and transmission tunnel is fitted. Website Developed by Insanity Racing. Copyright © 2018 by Insanty Racing.